The schematic image of some bilateral-symmetric radiolarians from Late Paleozoic of Southern Urals. 1 - skeletal elements of Raphidociclicus gemellus Nazarov et Rudenko sp. nov. (in the plan); 2 - skeletal elements of Raphidociclicus huilcus Nazarov et Rudenko sp. 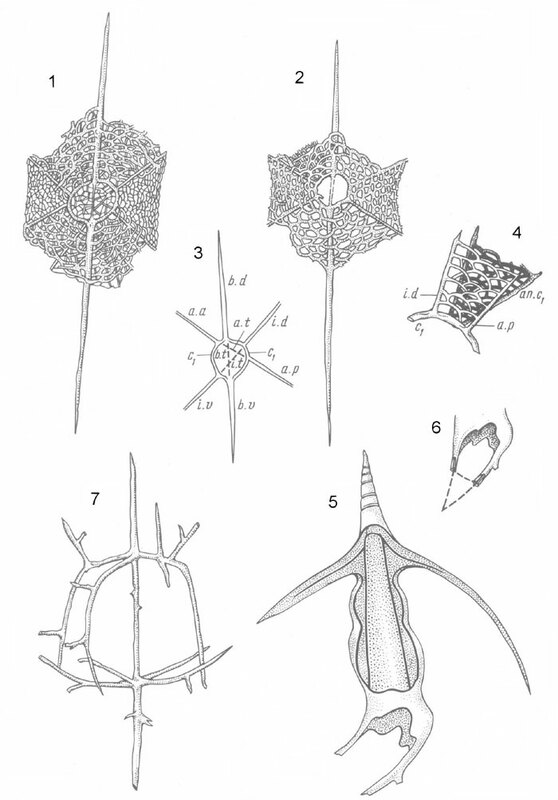 nov.; 3 - prospective parity of spines of radiolarians of Raphidociclicus Nazarov et Rudenko gen. nov. (alphabetic explanations - see Holdsworth, 1969, p. 233; Nazarov, 1975, p. 98-99); 4 - parity between spines and shoots of ring-like edge of Raphidociclicus hiulcus Nazarov et Rudenko sp. nov., forming rosettes; 5 - internal structure of Haplodiacanthus Nazarov et Rudenko gen. nov.; 6 - prospective connection of trabeculae of Haplodiacanthus Nazarov et Rudenko gen. nov.; — schematic image of Campanulithus Nazarov et Rudenko gen. nov.